Is the Scandinavian model restricted to Scandinavia? A year from now, the most important referendum in the history of Scotland will take place. In foreign policy, England has always tended to ignore the Nordic countries and preferred to look south towards France, and the UK has of course always been dominated by England in this regard, but after independence Scotland can revert to being a Northern European country. Obviously, Scotland isn’t part of Scandinavia like Denmark, Norway and Sweden. 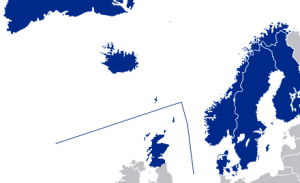 However, can an independent Scotland be regarded as a Nordic country? If so, joining the Nordic Council would be possible. The usual definition of the Nordic countries includes only Denmark, Norway, Sweden, Iceland, Finland, Greenland, the Faeroe Islands and the Åland Islands. However, a brief glance at a map shows that Scotland would be a natural addition to the list. Scandinavia is largely defined by language — Danish, Swedish and Norwegian are mutually intelligible after a few weeks’ exposure. This isn’t true for the other languages of the Nordics, however. Also, people from all the Nordic countries are increasingly using English amongst themselves, so not knowing a Scandinavian language might not be a real problem. In fact, I have a suspicion that the Finns and the Icelanders might be quite happy to get an excuse to use English — although Finnish-speaking Finns learn Swedish at school, almost none of them are able to understand spoken Danish. Historically, the non-Scandinavian Nordic countries are, or have been, ruled by a Scandinavian one: the Faeroes and Greenland are still controlled by Denmark (although they have devolution), Iceland was Danish until 1944, and Finland and Åland were part of Sweden until 1809. Orkney and Shetland were part of Denmark-Norway until 1468, when they were pawned to Scotland, and many Scottish islands were under Viking rule a few centuries before that, so there are definitely some historical connexions there that might be useful when submitting the membership application. However, at the end of the day the Nordic Council is a club for small Northern European countries with a Social-Democratic mindset. If Scotland goes down the Common Weal path, I expect the Nordic Countries will be more than happy to let Scotland join. Dan Witzner Hansen liked this on Facebook. Therese Hansen liked this on Facebook. I think the connection to the Nordic countries is obvious. Scotland in its heart of hearts is not Gaelic. It’s Nordic. There has always been a struggle between the two. Catholic vs Protestant, Highland vs Lowlander, Celtics vs Rangers, etc. In case you’re curious, I believe Scotland should be apart from the Nordic countries. I’m not really Celtic or Catholic, but it seems that the Nordic influence has had an oppressive hold on Scotland.